These notes were compiled whilst watching the SRM5 videos at http://vmwarelearning.com by Andrew Ellwood. The videos are well worth watching when you have the time – if you don’t then these notes will suffice as a primer. The videos go into vSphere replication as opposed to array-based replication, but – even if you will be using array-based replication – the information contained is very useful when planning for SRM5. VMware vCenter Server 5.0 must be installed at both the protected site and the recovery site. 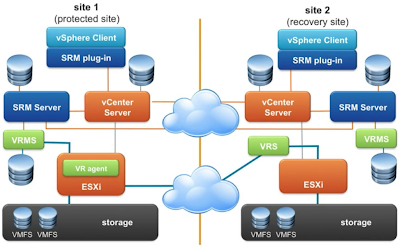 A single instance of the VMware vSphere Client installed with the VMware vCenter Site Recovery Manager Plug-In, can manage both sites. 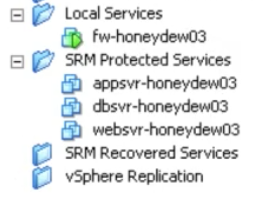 Even if you do not plan to use vSphere Replication, you can install vSphere Replication when prompted – this just makes the binaries and VRMS and VRS OVF’s available. Note: Array-based replication and VR (vSphere Replication) are complementary solutions and can be used together. With array-based replication, the LUN design has to be done in such a way that only the servers requiring replication are replicated. This could be done on a one server per LUN basis, or multiple replicated servers per LUN, with un-replicated LUNs for local servers. An advantage with vSphere Replication is that it can be done on a per-VM level as opposed to per datastore. In large deployment, you may have multiple VRS servers, but only need one VRMS per site. Inventory mappings are optional but recommended. An inventory mapping specifies the resources that a recovered virtual machine uses. For a virtual machine that is not fully mapped, then its mappings must be individually configured when you protect it! Placeholder datastores are where we put the virtual machine configuration files on the recovery site in anticipation of that VM failing over. Note: For VMs that share a datastore group, you cannot just fail-over one, you must fail-over all! - Which virtual machines at the recovery site are to be suspended? You get to choose a Test Network! 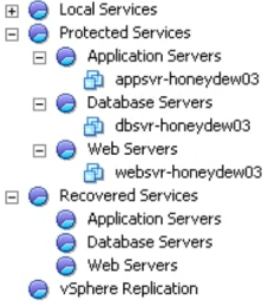 Can leverage Priorities and Dependencies to get VMs to start in the correct order! Add Non-Critical VM – can pause a VM to release resource for more critical servers. A recovery plan is essentially a script! Of course, if the original protected site is gone, there is nothing to failback to, in which case – using the templates from the recovery site – we can rebuild the configuration in the reverse direction!